Difficulty: Undulating contour walking with limited amounts of shade. This is a reasonably easy circular walk along earth tracks and designated nature trails which takes in the finest Byzantine church on the island. 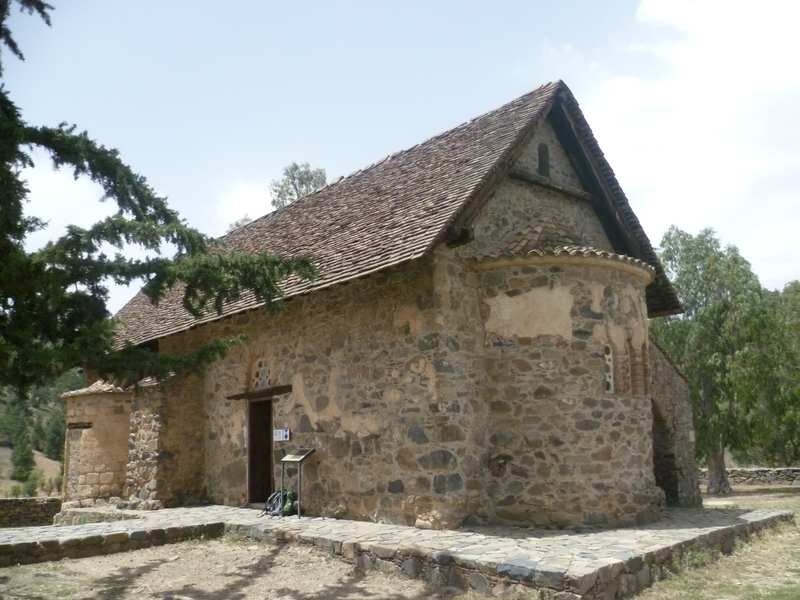 Although the walking itself is little more than half a day, you will probably need to allow some time to look around the church itself, particularly if there are a number of tourist coach parties around. 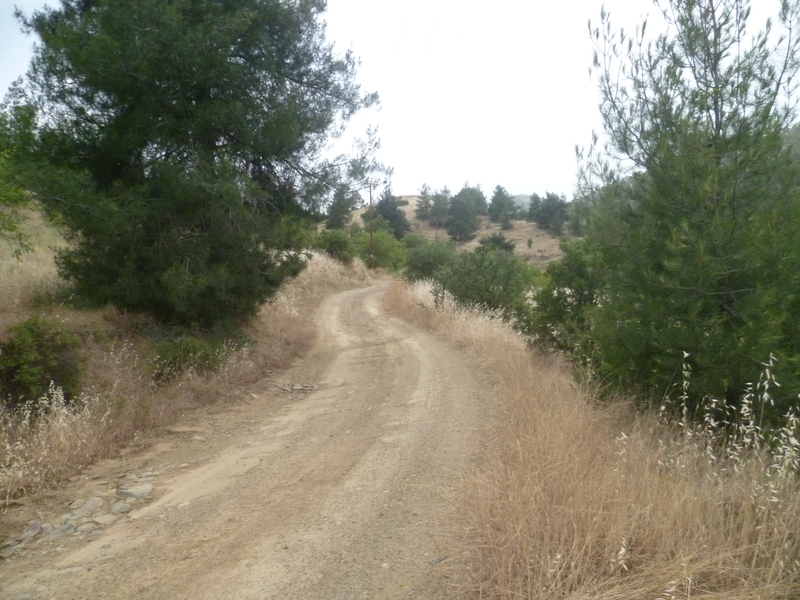 The walk starts from the small village of Agios Theodoros just off the B9 to the north east of Kakopetria. We drove up the B9 beyond Evrychou and then took the F975 into the village. On the way into the village – just past a right hand bend after the village sign – there is a Forestry Department car park and we left our car there. Turn right out of the car park, walking a few yards back down the road until you come to a green signpost. 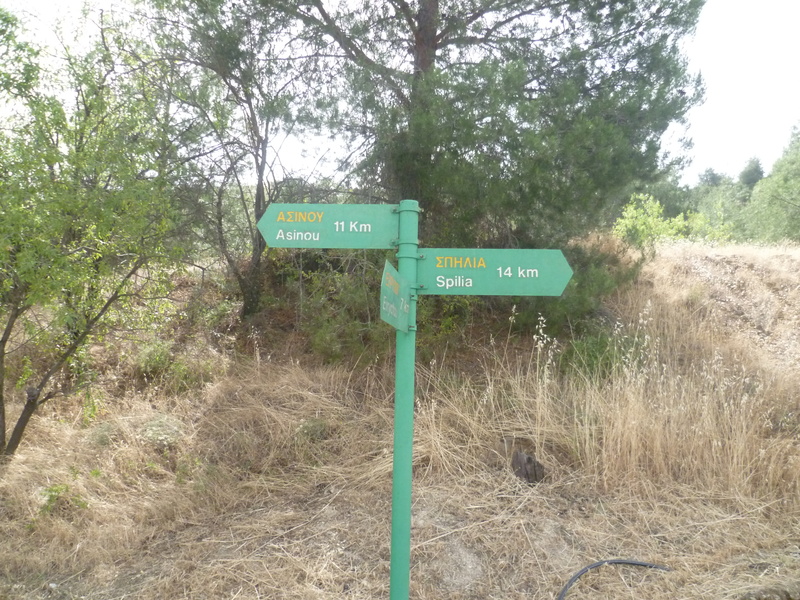 Follow the signpost to ‘Asinou 11 km’, effectively walking straight ahead down Agias Markellas Street. 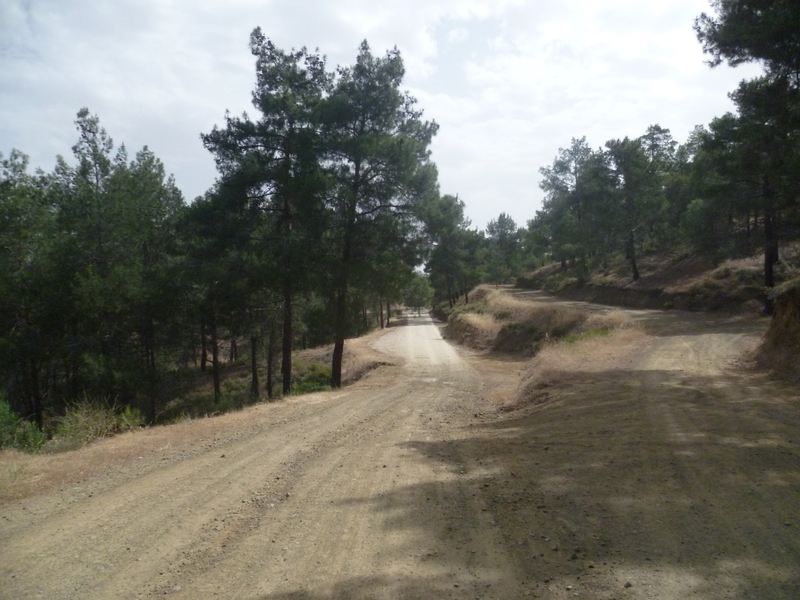 This is an asphalt road which winds upwards through pine trees and, after 10 minutes, becomes an earth track. You will shortly afterwards pass a wooden sign identifying the location as Kantzelia, at an altitude of 491 metres. Keep following the main earth track ignoring a right hand fork after 12 minutes. So, in the picture above, keep walking ahead on the earth track which will now continue to wend its way through pine woods, gradually starting to descend. Just when you’re beginning to wonder if the track is really heading in the right direction you will see – at 22 minutes – a blue sign pointing out a track to your right headed for Asinou. Take this right hand turning and keep following the main earth road. You will not need to deviate from this main track for the next couple of hours until you reach the Asinou Picnic Site (see below). 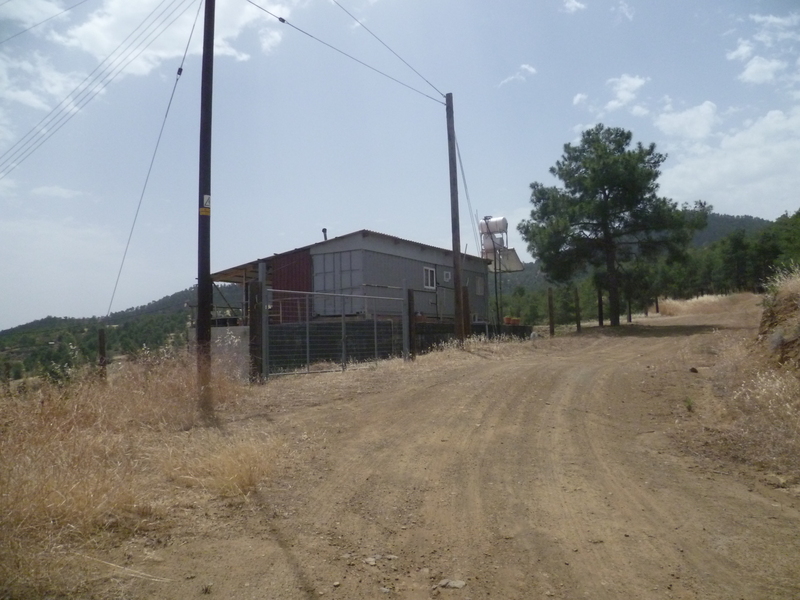 At 27 minutes you will pass a solitary house on a right hand bend in the track and at 35 minutes you will come to a wide fork where, just to the right, a wooden sign identifies the area as Chalkokolympos, altitude 420m . Stay on the main track as it forks to the left. 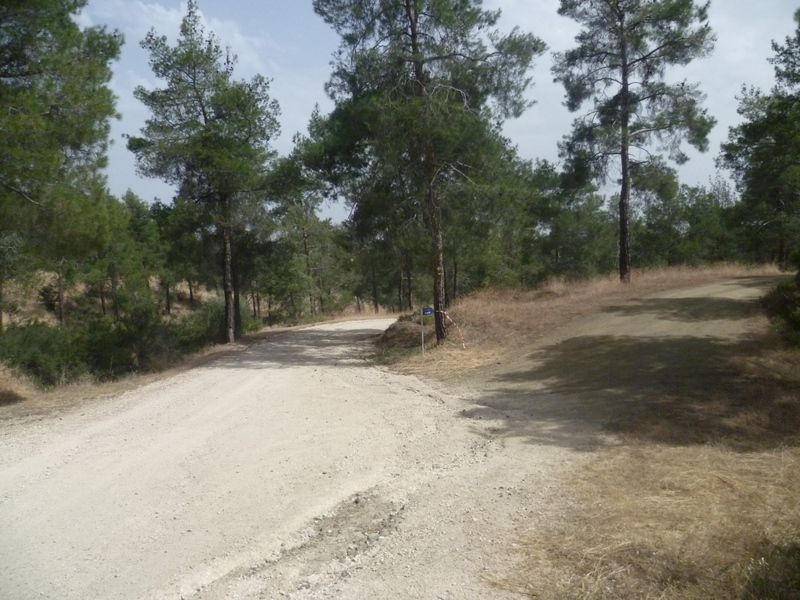 The track opens out to provide good views across to the north of the island and you are now effectively following a contour trail around the edges of a pine forest. The track is undulating: largely level at first but becoming gradually steeper. This is not a particular problem but it should be borne in mind that there is very little shade and the walk can be quite sapping on hot and/or humid days. At around 2 hours 20 minutes you will see the village of Nikitari appear below to the left of the track and approximately 15 minutes later the track will gradually wind down towards the Asinou Picnic Site (2 hours 40 minutes). There is an opportunity to refill water bottles from a tap here where the water is fresh and deliciously cold. There are also toilets and plenty of picnic tables and benches. When you are ready to carry on, there is still a little way to go to Asinou itself. Walk uphill along the asphalt road from the picnic site. It isn’t busy as it effectively ends at Asinou but there will inevitably be the odd tour bus or two. We last visited this church around 10 years ago on a misty day in late October and, apart from the custodian, we had it to ourselves. This time we were joined by a steady stream of tourist coaches visiting the church and having lunch at the nearby restaurants. The church is a popular tourist site for good reason. Every inch of the shadowy interior (take a torch – no photos allowed) is covered with Byzantine murals painted between the early 11th and late 15th centuries and depicting Biblical scenes as well as portraits of various donors who paid for the church and its murals. I particularly like the bust of the Virgin Mary painted above one of the doorways, with a pair of tethered hounds and two moufflons against a background of snowy mountains background. The scenes from the Last Judgement are spectacularly gruesome! There’s a water tap outside but on the day we tried it the water was warm enough for a hot bath! Much better to visit one of the cafes and buy an ice cold drink. Or two. 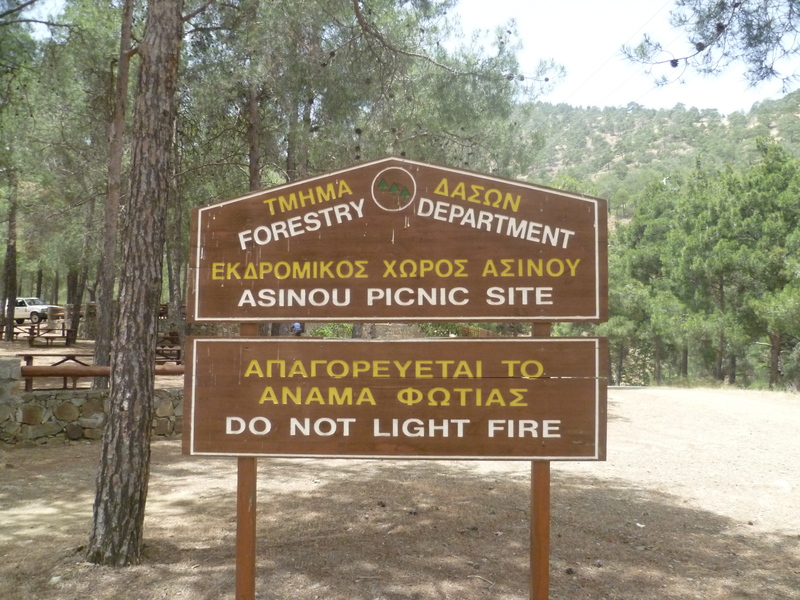 When you are ready to return to Agios Theodoros you will need to find the marked walking trail which takes you back through the pine forest. 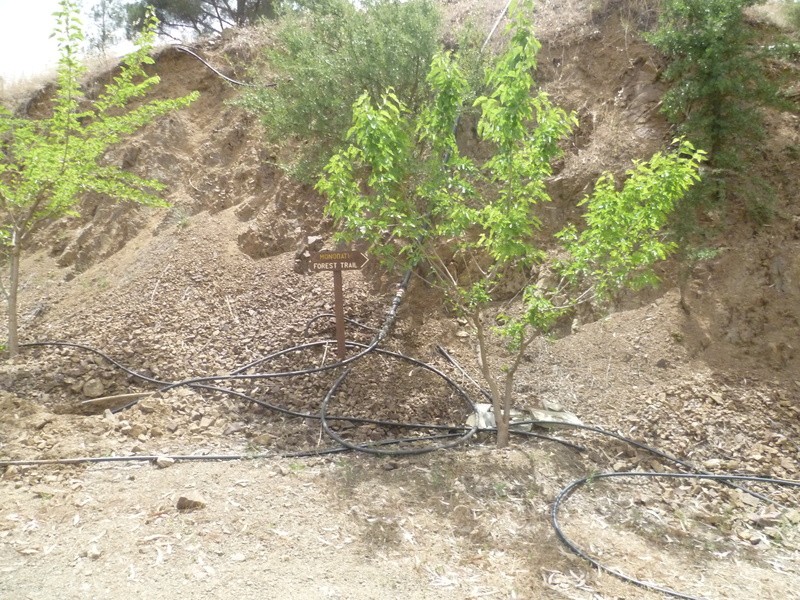 It is marked up as the ‘Forest Trail Asinou-Agios Theodoros’ and is identified on the trailboard in front of the church. … and then behind the restaurant keep following the road as it heads off to the right. 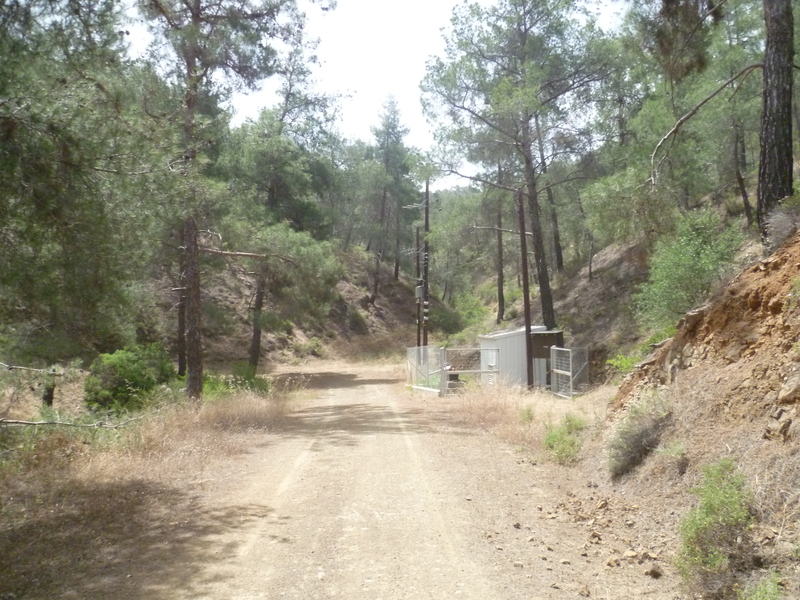 This is your walking track back to Agios Theodoros. It is very well marked and you should have little difficulty following it through the woods. The trail is marked by small wooden boards with white arrows on them and if you keep these in mind you shouldn’t go wrong. …and numerous other wooden boards identifying the distance walked and the distance still remaining. 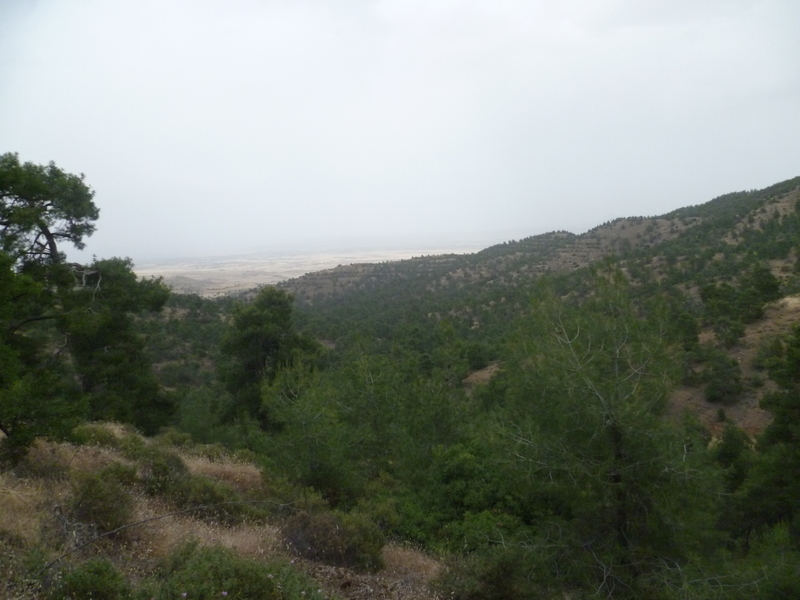 The trail is through beautiful pine woodland with some quite steep uphill sections. 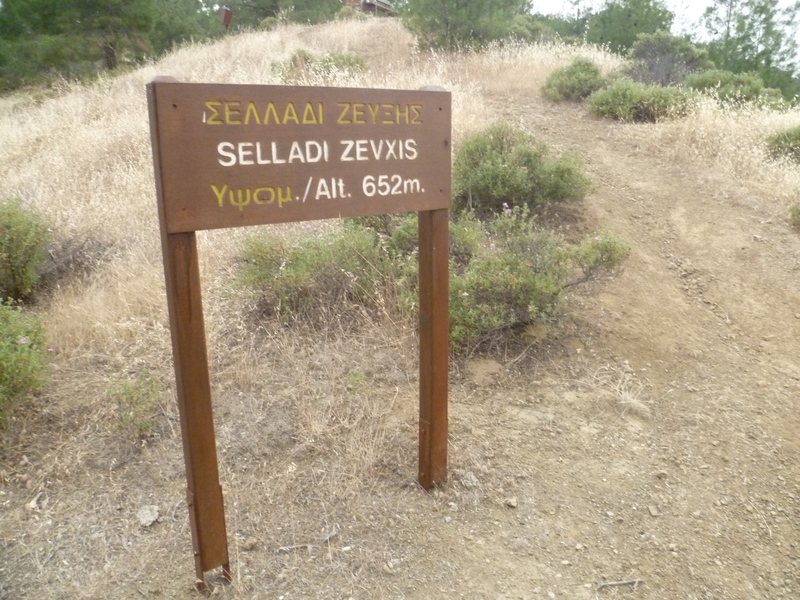 The high point is reached after 3 hours 45 minutes when a final brief but steep climb brings you to Selladi Zevxis at an altitude of 652 metres. 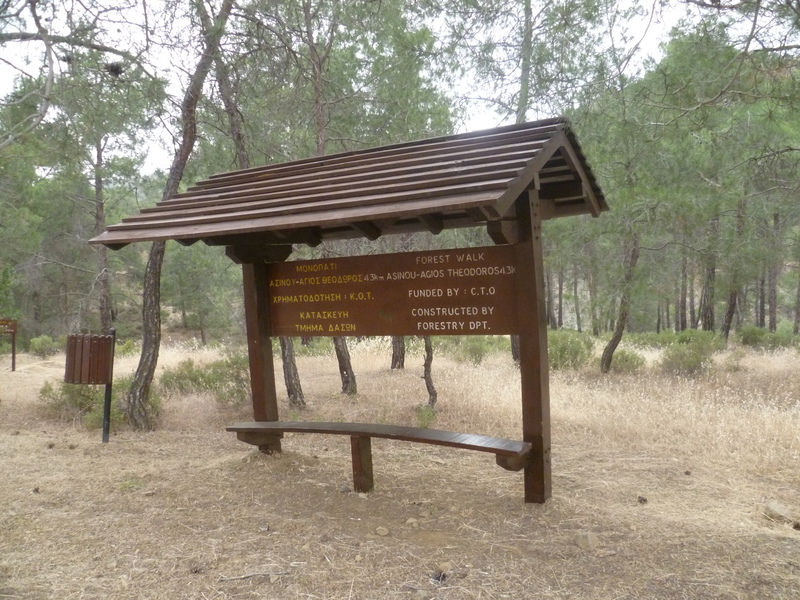 The trail opens out onto a ridge where there is a bench and viewing point. From now on you are once again walking the contours, descending gradually, and looking out across wide open valleys onto the distant plains. 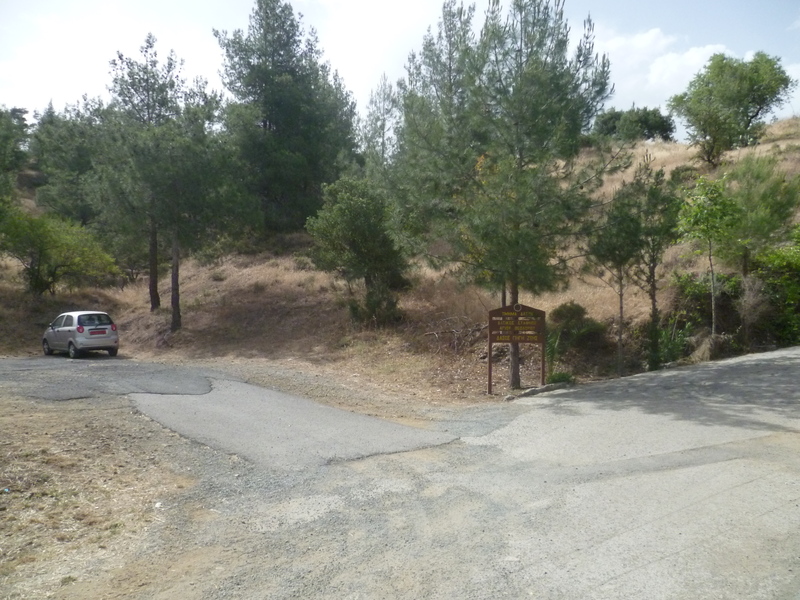 Keep following the trail as it descends towards Agios Theodoros, passing the village cemetery on your left (4 hours 15 minutes) and shortly afterwards arriving out on the F975 asphalt road which passes through the village. 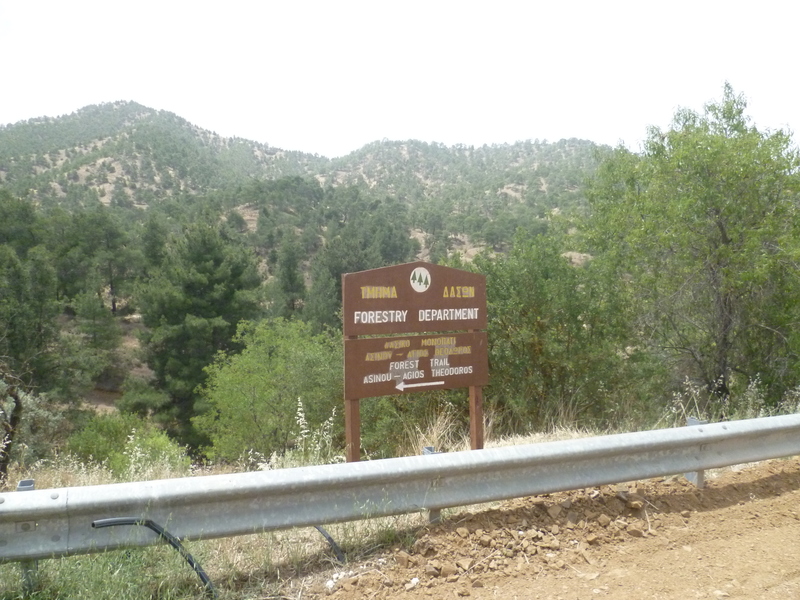 There is a trail board here on your right as you emerge onto the road at 4 hours 25 minutes. Turn right onto the quiet F975 and walk for a few brief minutes to return to the Forestry Department car park after 4 hours 30 minutes.